Linda Hellcat, owner and stylistic designer of Maiden Leather Designs, knows a thing or two about motorcycles. Based in Irvine, TX Linda does more than design items for the motorcycle riders, she lives the life. Riding her own turquoise Harley named Chiquita, Linda finds her passion in all-things-motorcycles. Being creative is in her blood, with Linda finding her calling in leather accessories for riders. Creating one-of-a-kind customized accessories, Maiden Leather is an example of the very essence of motorcycling ~ the expression of individuality. 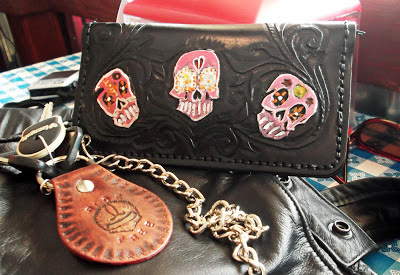 The list of items she creates include customized and/or personalized wristbands, wallets, saddlebags, tool bags, medicine or charm bags, belts, points covers, key chains, wallets, jewelry, purses, and even motorcycle seats. Recently I ordered a custom wallet for my travels. Giving Linda some ideas of colors and a design I liked, I received my wallet in short order, along with a key fob, a coin purse and flowered hair pin. Made especially for me, with my name and nickname embossed in the wallet and the strap, my wallet was fantastic. Well crafted of incredibly heavy leather and complete with a chain to strap it on by belt while riding, the wallet zips shut as well as snaps securely down to keep my valuables safe. I found the leather in all of the items to be rugged and sturdy enough to take heavy wear, but flexible enough to be useful and handled easily. Best of all was the impeccable design work. Flawlessly hand-tooled with intricate sugar skulls and swirls, painted with a durable, high grade leather paint, this wallet is an extraordinary work of art. Having carried the wallet for a month now while riding across the country, in and out of my bag and pockets, it has proven to wear well and still looks brand new. "Leather always looks better after it's broken in," Linda says. This, and all of Linda Hellcat's leather designs can be found at Maiden Leather Designs. I would venture to say if you can dream it and you want it, Linda can make it into leather.